A few of us from our Pune Homeschoolers group were interviewed recently. The journalist Karuna did a good spread about Homeschooling and Unschooling. She interviewed me for over 2 hours and has written candidly and clearly. I was nervous about being misrepresented and quoted out of context… as has happened in the past (a few months ago). But Urmila assured me that this journalist came across differently. And after reading the article i can see that she was right. Its for a Marathi supplement paper that is part of the Times of India Group. I will get a translation from a friend within a few days and post that link back here. Then you click “next” at the end of the article twice to get to the 3rd page…. where our individual interviews are. Schools fail to create an environment where children would feel like going to school willingly, and learn there 3-4 hrs happily. So, to foster learning, an enthusiastic environment should be created…says Hema. Hema has been unschooling her children Raghu and Zoya. She has not used books to teach her children ABCD. Her house is first meant for the children. A proper environment has been created at home to learn, and there are lots of opportunities to explore. One can feel it as soon as one enters the house. Raghu is interested in engineering skills and science, so a card sheet lab has been created in the drawing room. There was a medical reason behind unschooling Raghu. Hema adds, while we were in USA Raghu was allergic to certain pollens. His illness had led him to seek emergence medical treatment. “Dr. Kevin Holder has changed our lives.” We use to give lots of healthy food to Raghu, to prevent his allergies. Whether he liked it or not was not very important then. However, Dr. Holder gave us lots of good suggestions, like listening to your children, trusting them etc. So Raghu started getting the food he liked to eat. He got cured completely within few months, but because of his illness, he was under mental stress… so going to school was not advisable for him. At that time Dr. Holder suggested us the option of home schooling. In the mean time, we gathered lots of information regarding home schooling and unschooling. “Listen to your children trust them”. This advise led us to take our decision. We were little skeptical about “learning” with 30 or more children in the classroom. In the mean time Raghu had started learning things at home. His grasping power was also good. He was interested in learning many things. His natural way of learning wouldn’t have got justice at school, so we decided to unschool Raghu. Raghu is curious to know many things. At the age of 7 he knows positive and negative effects of magnets. We should give options for learning and let the child choose whatever he likes says Hema. Each parent feels that our children should learn and earn more than them. But while doing that, importance is not given to the mental satisfaction and happiness of the child. In unschooling, this need is fulfilled, so there is scope for all round development. Compulsion to sit quietly in one place, no freedom, one class, all same age group children….. in such an environment how can children learn? this question bothers Hema a lot. So she is very firm on decision to unschool Raghu forever. Ravi was taking a call from a close friend… but it was Sunday and his only day this week with the kids… he worked Saturday too. So Raghu was mad. And i was trying to help Ravi finish his call and Ravi was mad at Raghu for not letting him finish the call… so Raghu and i figured doing something to Ravi’s body might be fun so Raghu could bear the waiting period. So he colored Ravi’s legs and nails with markers. That gave Ravi about 8 minutes more on the phone. And to his credit, Ravi has not taken any calls for the rest of the day. I’ve been spending time on the floor building with lego alongside Raghu. 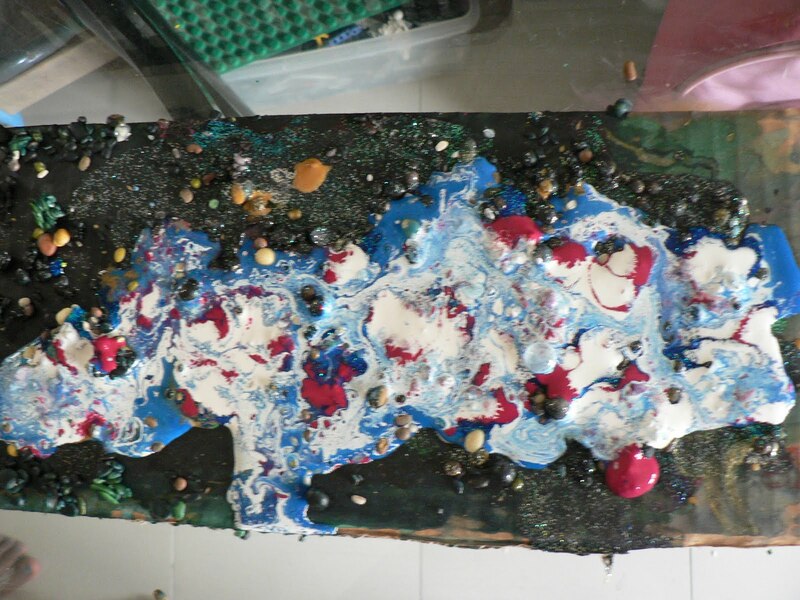 However i figured i could make some art… abstracts to engage my interest more fully. So here is one such image. 5 minutes after i made it… i destroyed it. It felt like Sand-Manadala making. 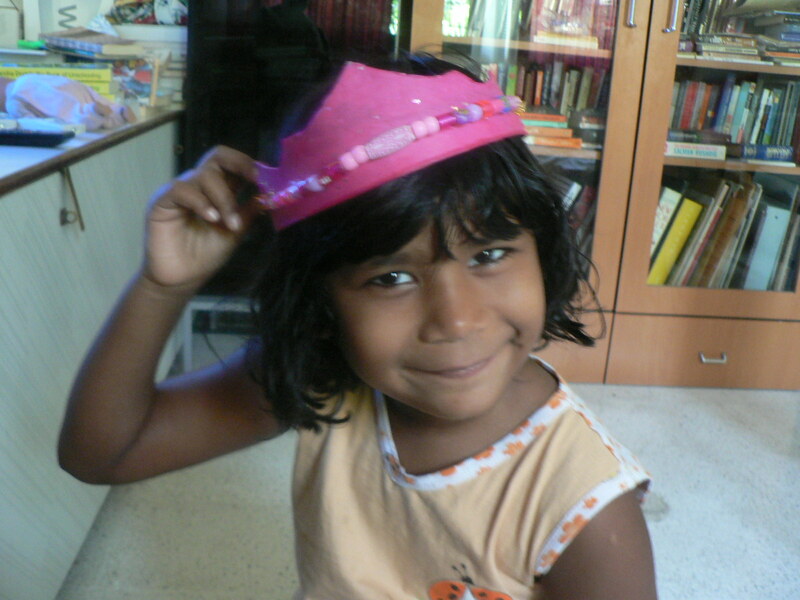 Zoya and i made this crown this morning. My little princess is very into Angelina Ballerina and princesses. We have been consuming inordinate amounts of Mangoes. Zoya eats them with the skin! I eat only the pulp. Its been glorious. 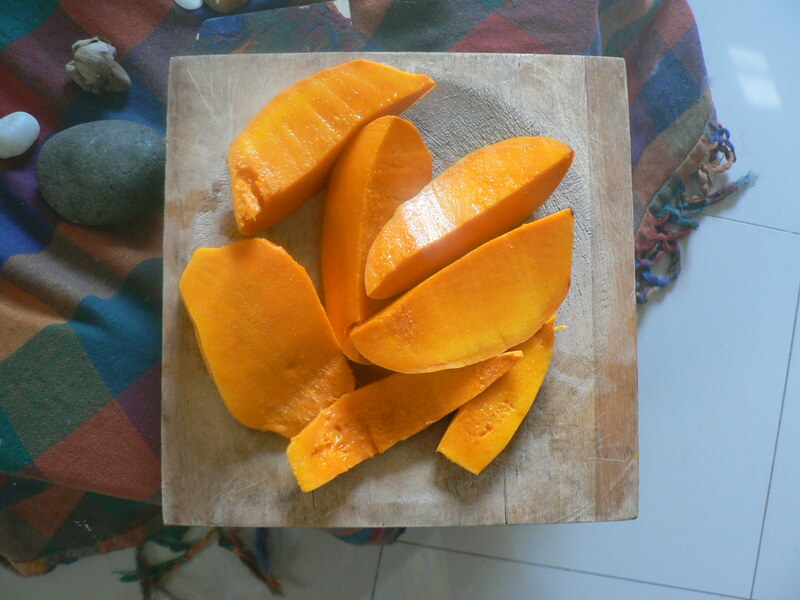 Here is a picture of the mango variety i love best “Alphonso or Aapoos”. We have been getting boxes of organic mangoes and making mango shakes, pulp with chapatis or just eating them with juice dribbling down our chins. We is Ravi, Zoya and me. Raghu can’t tolerate our mango breath! I’m glad i’ve learnt to accept him as an individual… not as a ‘kid’ who needs fruit to ‘balance’ out his diet. Hooray for eating what makes our body happy. My kids eat with happiness and joy. They eat when they are hungry. I catch myself cajoling them to eat when others eat and have learnt to stop that. They eat because they are hungry and want to nourish their bodies not because others are eating or that the food is on ration or has to be finished or else or because of emotional black mail ( good boy if you eat, bad if you don’t) etc. Raghu enjoys breakfasting with Ravi in the morning before ravi goes to work. The time suits them both… and they like eating together at the table. Its sweet. The moment we force him to eat, the sweetness is gone. I’d like the mangoes of the world to remain sweet for my children. Raghu asked for help with defeating some character on Mario Super Galaxy. As i sat there watching and helping occasionally (mostly helping with focusing and targeting a shoot) i saw how determined and focused Raghu could be. I’ve seen this many times but had not acknowledged it much. When he is doing something he really wants to do he can be tenacious. I can imagine that anything he really sets out to learn he can. He has been doing a lot of mental math simply in order to keep track of stars/things bought on Club Penguin etc. This used to be hard for him… and now its second nature. he will ask me to confirm his calculations several times in a day. Which i happily do. Raghu used to say (after a sad playground fight) that he could never do math… his words. And now i remember that and smile. And some day when he needs reminding… i can remind him of this. His tenacity even when he looses a whole half hour worth of Mario levels/gaming…. is incredible. he may cry or become angry but will soon get back and go go go. I guess we are all like that depending on what the task at hand is and whether we really want something bad. The old-me would be happier if he was tenacious doing math/art etc. Now i see the learning everywhere and can appreciate Raghu’s focus and drive no matter he is working on. I get flustered in Video games and find my eyes tiring out quickly. I even find it hard to sit at a computer for too long. So I would project this on to my kids and think that media has to be controlled because of eye-strain. Yet i know that i too am tenacious when i set out to paint or read.. and no matter how much i read i know how to rest my eyes and continue reading. I’m sure my kids figure that out too. They will/do take breaks for food, jumping on the trampoline or running around the house. We talk about how our eyes send us messages… watering eyes, red-eye etc… and how we can help our eyes rest. The large TV screen-Wii has made things better… the DS handheld and PSP are both tiny screens. I can see how Raghu loves to move around the room and hit the tennis ball or enjoys showing us his moves on Mario etc. And when the wii is freely available (again within the means possible… zoya gets her turn too) there is less need for extending play non stop. An easy break and knowing that your ‘turn’ is still on… sister’s turn will be later on… so i can do as i will with my time for Wii makes for stress-free-play. Of course they play together too and there is no hard and fast set time limit. things are fairly loose if the 2 using the wii are feeling that way. Some days we agree on time-limits for each.. some days they work it out and ease in and out. Raghu is keen to explore and experiment thru his games. He will often just try out games and see if they feel good. He has many opportunities to try things out. This helps him a lot. I enjoy the luxury of trying things out too. I had enrolled in a pre-paid-gym and slowly over 3-5 months i figured out that i don’t like being in the gym. the account is now frozen and Ravi will use the membership. I lost some of the money. I beat myself up about it and figured i’d take a small bite next time. Now ravi and i hired a personal Yoga trainer to come home every morning at 6 am for an hour. It was a trial of 2 weeks before confirming. We love it. Ah, the pleasure of trying out something and testing and tuning into our body’s response etc. Someone on an unschooling list said that her brother was forced to finish he food/clean plate, usual stuff. And years later got to know that he has a mild allergy to the one part of eggs (yellow or white .. i can’t remember)… ridiculous battle fought. Someone else wrote about seeing her child figure out which foods made her feel better and which did’nt. I notice that Raghu will say things like “thats not a combination i like or my stomach hurts when i eat that, or simply i don’t want that”… for someone talking from knowing his own body well… that is enough of an indication for me to back off. I offer different foods all the time and the responses keep changing. Raghu has not eaten dosas in a long while. I noticed how he has been eating more eggs and bacon lately and figured its a good time for our fermented, high-protein dosas. And sure enough raghu has been eating dosas for a couple of days now. I did it to just add variety… and cause i don’t like the smell of bacon much. So i do acknowledge my needs too… but if raghu had insisted on bacon… i’d make it for him. And by offering variety he appreciates the change too. Well back to the title.. It makes me happy to see my kids pursue their interests with tenacity. Zoya started to swim and float on her back. She can retrieve things from the bottom of the pool. She is so agile in water… its beautiful to watch. 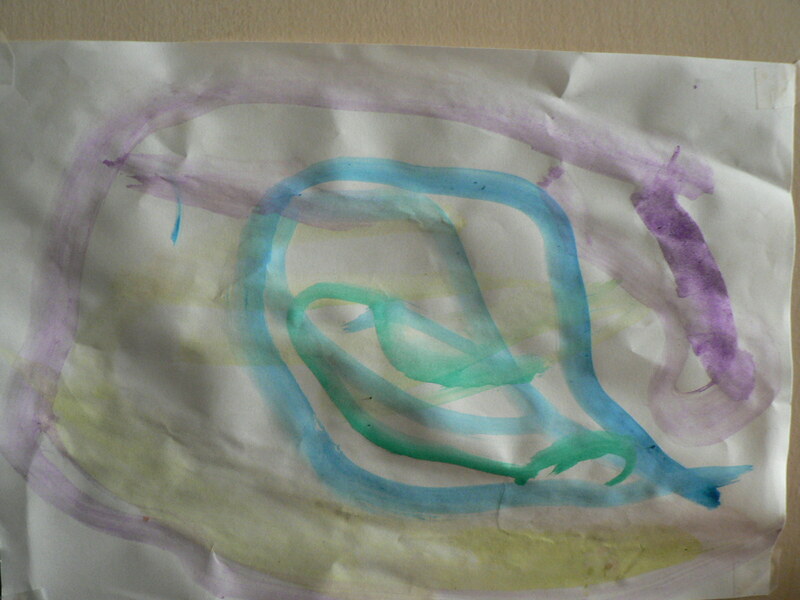 Zoya made this lovely, airy, luminescent water color painting yesterday during our Tuesday playdate. 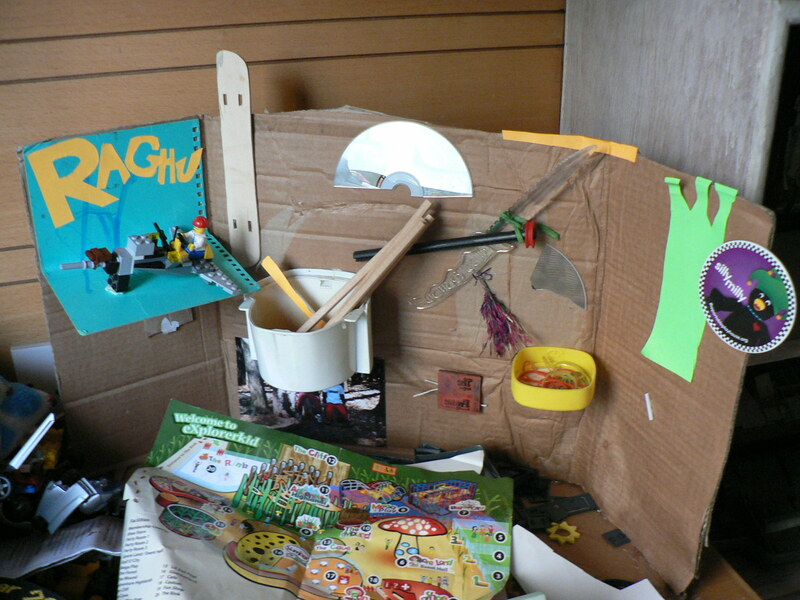 Raghu made this 3-fold 3-dimensional collage for his desk. I worked on it with him. He did a lot of directing, glue-gun-gluing and cutting out. Notice the old-coffee-maker filter pot stuck on for a pen-holder. 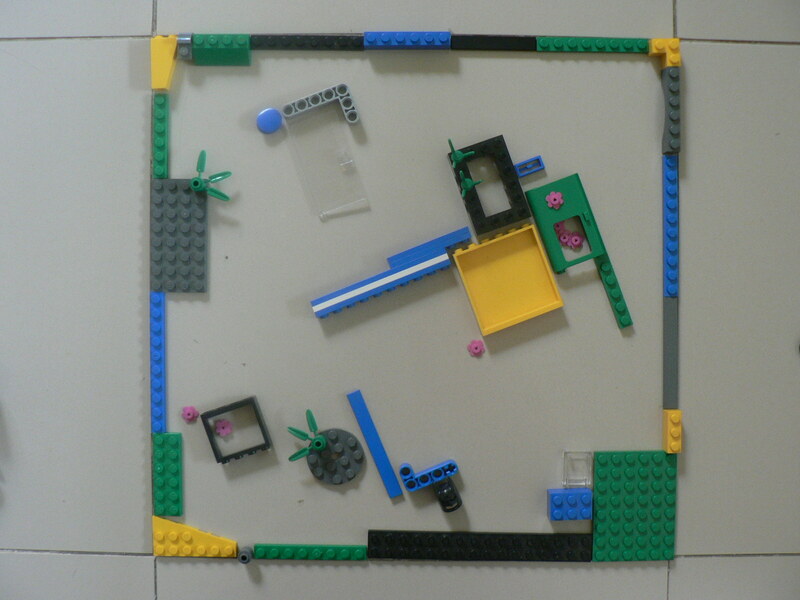 There is even a Lego shelf and a small, upturned lid for odds and ends. 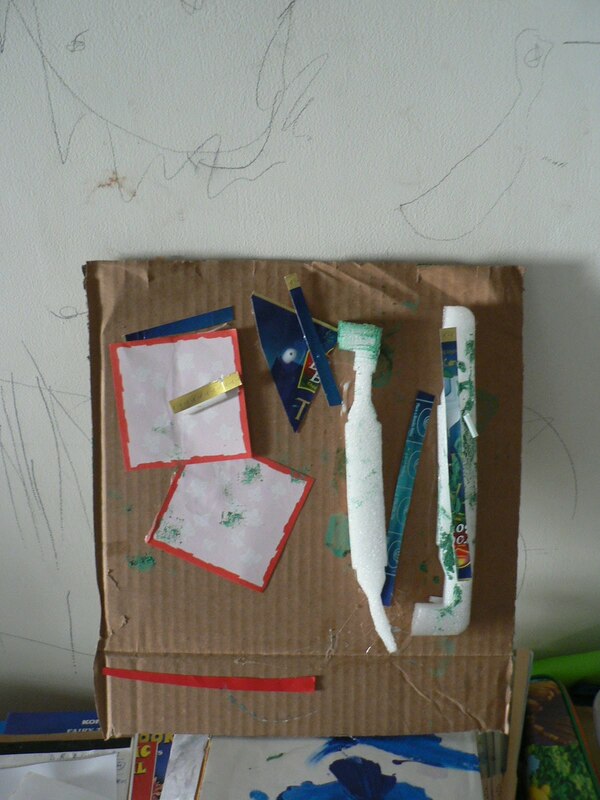 Zoya made this interesting collage on cardboard. She is inspired to collect things for our collage-treasure box ever since our Farmer’s Market visit in Mumbai. They had a similar set up for kids there by this interesting group. 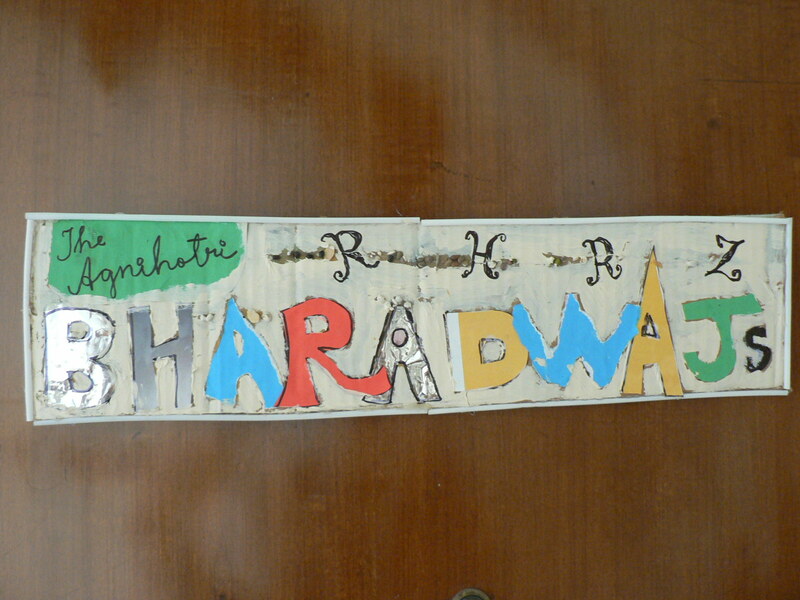 I worked on this new nameplate for our main door with the kids. I’d like to post some more swimming video clips. The kids are truly like fish. 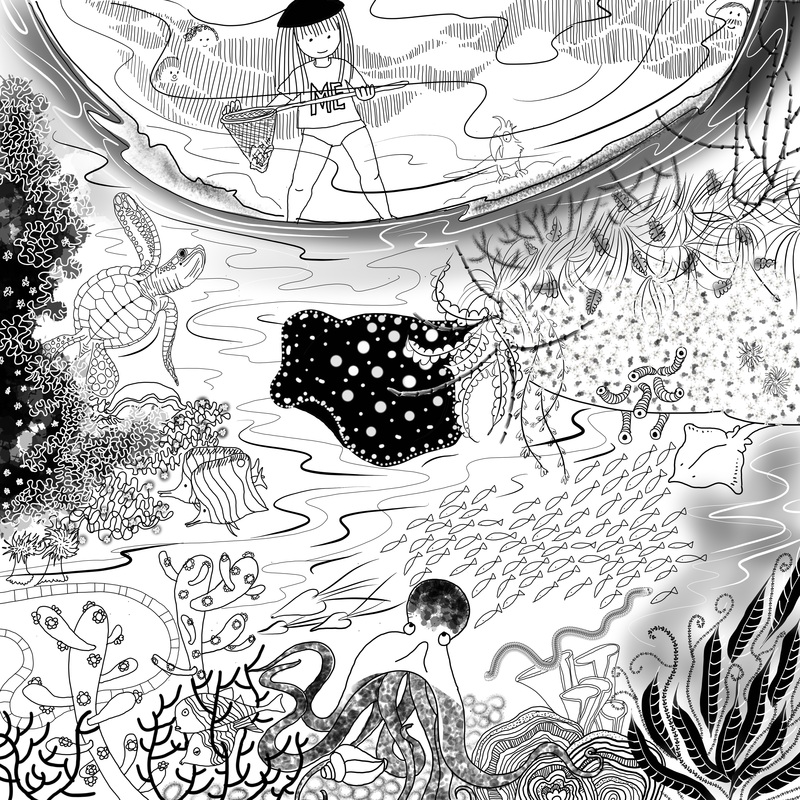 This one is of Raghu flipping underwater. He had only just figured out how to that. So we were all super excited.